A collection of 8 pieces based on the composers students. Grade 3 - 6. To view A4 sized printable sample pages simply click on a page image above. 'Takes all sorts!' was an inspired project by the composer to capture the unique and diverse personalities of some of her students. As the pieces are largely pattern based, they make good learning material and many can be played with fairly minimal practice. There is also opportunity for improvisation (however a solo is provided for the wary!) and one or two fun effects along the way! 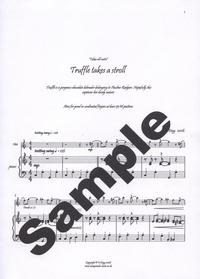 Truffle takes a stroll - A quirky little piece in trotting 4,4 format. Truffle is a gorgeous chocolate labrador belonging to adult student Pauline. Have fun listening to the interaction between piano and flute, complete with tail wags! (trill/flutter). Loretta learns the blues - Saxophone student Loretta was always keen to play this style. The piece begins with a funky piano riff before the flute kicks in and struts its stuff! Jonathan gets his groove on! - Is a fast and funky 4,4 piece inspired by Jonathan, a lovely teenager full of life and random antics! Both pianist and flautist must stay on the ball as there are unexpected rhythms at times! 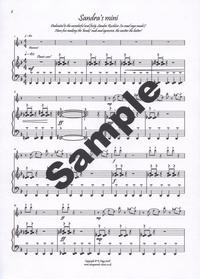 This piece features a 16 bar blues (complete with finger clicks from the pianist) where notes are given to improvise with (or alternatively play the written out solo). Johns new flute - Simply just that; a lyrical little piece in honour of Johns new purchase! Sandra's mini - Dedicated to the petite but feisty Sandra, Sandra's mini tells the short tale of a brief car journey, frantic with road rage! Great fun if you've had a bad day as the 'honks' can be as loud and unrefined as you dare! Honkytonk-arama - Just that! Written with Naomi in mind (teenage Clarinet student with a great sense of fun, and an infectious giggle!). The use of accelerando makes this piece fun for the soloist to enjoy taking the lead! If you select the PDF/MP3 email delivery option on ordering, your files will be sent to you within 48 hours of ordering. Please note; If you reside in France, we can highly recommend ordering Takes all sorts! (flute printed edition) from our France distributor Musique Egele in Colmar. Order from Musique Egele here. 'Takes all sorts!' (Bb Clarinet & Piano) with CD. 'Takes all sorts!' 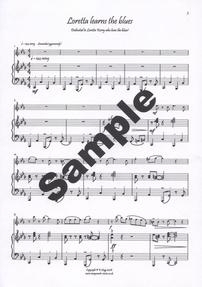 (Eb Saxophone & Piano) Email Edition (PDF/MP3). 'Takes all sorts!' (Eb Saxophone & Piano) with CD.